Over the past several months my small group has been going through the book of Romans. 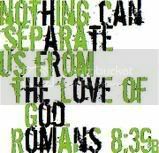 In Romans 8 Pauls writes, "Therefore, there is now no condemnation for those who are in Christ Jesus. . ." He goes on to encourage believers in the future glory that all of creation eagerly waits and even groans for. He finishes the chapter with a great promise in verses 38-39. "For I am convinced that neither death nor life, neither angels nor demons, neither the present nor the future, nor any powers, neither height nor depth, nor anything else in all creation, will be able to separate us from the love of God that is in Christ Jesus our Lord". For this reason we are more than conquerors. Praise God!